In lithium-rich granite pegmatites (Anthony et al., 2001—2005). 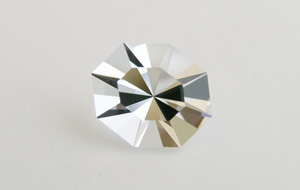 Rare in faceted specimens. Original description: ‘Pollux’ Breithaupt, J. F. A., 1846. Pollux — Annalen der Physik und Chemie 69: 439 [view in ‘Library’]. Type material: Technische Universität Bergakademie, Freiberg, Germany, 27111 (Anthony et al., 2001—2005). Etymology: named after Pollux, a figure from Greek mythology, brother of Castor, for its common association with ‘castorite’ [petalite]. Distribution: Afghanistan: Laghman; Brazil: Minas Gerais; Canada: Manitoba; Italy: around San Piero in Campo, Elba; Namibia: Karibib; Pakistan: Skardu and Gilgit; Sweden; USA: from a number of localities in Oxford Co., Maine; Zimbabwe (Anthony et al., 2001—2005). Essential elements: hydrogen (H), oxygen (O), sodium (Na), aluminium (Al), silicon (Si), caesium (Cs). Crystallography: isometric — hexoctahedral. Crystal habit: crystals rare, cubes, dodecahedra, or trapezohedra, commonly striated, up to 12 cm; as rounded grains, fine-grained, massive (Anthony et al., 2001—2005). Cleavage: in traces (Anthony et al., 2001—2005). Fracture: uneven to conchoidal (Anthony et al., 2001—2005). Tenacity: brittle (Arem, 1987: 151). Hardness: 6.5—7 (Arem, 1987: 151). Density: 2.86—2.94 g/cm3 (Lazzarelli, 2012). Luminescence: none. Radioactivity: GRapi 484.85. Colour: colourless, white, grey, or tinted pink, blue, violet; colourless in thin section (Anthony et al., 2001—2005). Diaphaneity: transparent to translucent (Anthony et al., 2001—2005). Lustre: vitreous; greasy to dull (Anthony et al., 2001—2005). Refractive index: 1.517—1.525 — isotropic (Lazzarelli, 2012). Birefringence: 0.014. Dispersion: none. Pleochroism: none. 4 specimens: 0337 — 0.88 ct, Brazil; 0414 — 0.59 ct, Brazil; 0023 — 1.64 ct, Brazil; 0472 — 1.62 ct, Brazil.